by Sean "The Karate Kid"
I didn't want to believe it either..But it Works! 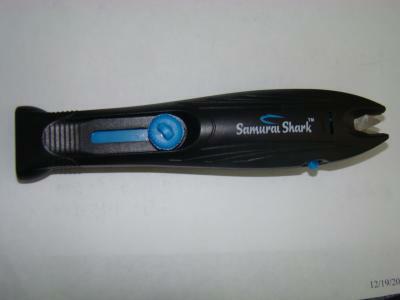 I really hate to say it, but I've tried to find different ways to sharpen my swords and knives, and BELIEVE IT, or most likely not, The Samurai Shark, that stupid "as seen on tv" sharpener, actually works! My wife got one for her birthday (she's as interested in swords, as I am) and she tried it on one of her crappy five dollar knives, and the thing became very very sharp! Now interested, we tried it on our other knives, and the result was the same! Before I was able to find this website, I bought the crappy replica swords like everyone does, and the samurai Shark even sharpened those...(as much as they can be anyway). I highly recommend it, and feel free to disagree with me, but from the Martial arts training I've had, this little "as seen on tv" device, actually works. Great review, it sharpens my katanas to razor sharp. It's a great tool for the house, however to sharpen my katana I had to use the hidden bottom blade of the sharpener as this keeps my sword's geometry, and avoids secondary-bevels. ...and yes; I am ashamed to say: It works great..everything from my swords to my paring knife are now Dangerous Weapons.